NEW DELHI: The International Cricket Council (ICC) has clarified that the Indian team was granted permission to wear camouflage military caps at the Ranchi ODI against Australia. Pakistan had taken objection. “The BCCI sought permission from the ICC to wear the caps as part of a fundraising drive and in memory of fallen soldiers who have died, which was granted,” ICC’s general manager Claire Furlong said in a statement. 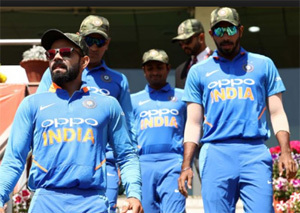 The Indian team sported the military caps at the ODI as a mark of respect to the armed forced, especially in the context of the Pulwama terror attack on CRPF personnel that killed 40 jawans. The Indian team donated the match fee in the third ODI played in Ranchi on March 8 to the National Defence Fund. The Pakistan Cricket Board had written to the ICC demanding action against India for wearing the camouflage caps. “They took permission from ICC for some other purpose and used it to do something else, which is not acceptable,” PCB chairman Ehsan Mani had said.